This article first appeared in The Edge Malaysia Weekly, on October 15, 2018 - October 21, 2018. UNSOLD completed homes are becoming a bitter pill of the slowly cooling Malaysian property market. The question now is how much worse the situation will get before absorption picks up. The latest data from the Valuation and Property Services Department (JPPH), released last Thursday, show that 4,539 homes entered overhang status in the first six months of 2018 (1H2018) alone — an 18.3% rise over six months. The increase was due to “slow market absorption”, JPPH says in a statement. Overhang is defined as a property that remains unsold nine months after it was completed. To put this into perspective, the additional 4,539 homes that became “overhang” in 1H2018 would have included the unsold portions of the 30,839 homes completed in 3Q2017. In 4Q2017, 20,227 new homes were completed and another 40,710 units were finished between Jan 1 and June 30 this year. The unsold units from these new completions will slowly join the overhang ranks in the coming months. As at March 31, another 453,175 residential units were incoming — properties where physical construction works are in progress or yet to receive final certification for occupation. Prospects do not bode well as residential market transactions have been under downward pressure in recent years. Transaction volume in 1H2018 fell for a fourth year running, down 0.8% to 94,202 units. In other words, absorption will likely continue to be sluggish. When contacted, CBRE|WTW managing director Foo Gee Jen says any further increase from hereon will be slower as he sees progressively lower proportions of higher-end properties in the expected completions this year and in 2019. “Developers have been moving to scale down the pricing, so we can see that the units coming onstream in the Klang Valley would range more between RM400,000 and RM500,000, which would be more palatable to the demand,” says Foo. The overhang growth has surged in the past several years, with overhang units rising by double-digit percentage figures annually in terms of both volume and value. The trend, essentially a lagging indicator due to the historical nature of the data, signalled an overheating market. The rapid growth rates are the lagging aftermath of the property market boom several years prior, which magnified a growing supply-demand mismatch at the time as prices grew faster than buying power. It is worth noting that homes take two to three years from launch to be completed, then another nine months without being sold before they become “overhang”. 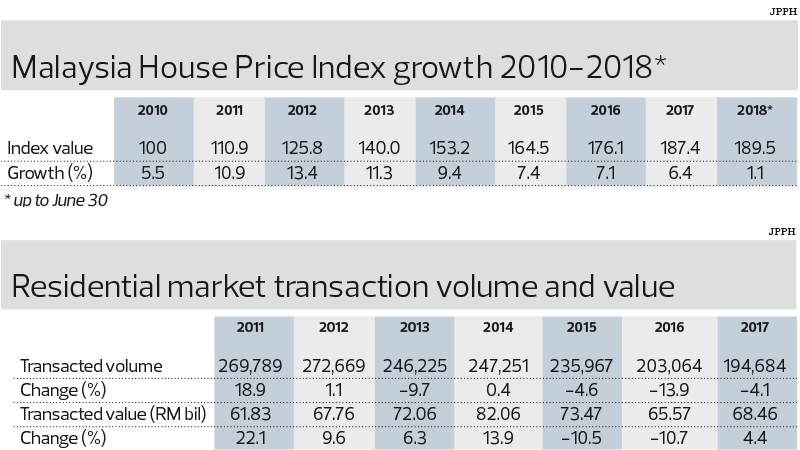 The Malaysian House Price Index accelerated in 2011, rising 10.9% to 110.9 points and sustained a double-digit growth pace for the next couple of years before decelerating. As at June 30, the index stood at 189.5 points, up just 1.1% from 187.4 points as at Dec 31, 2017. Historical data shows that overhang residential stock has essentially tripled in volume over the past 3½ years, while the cumulative value has grown 4.5 times. Back in 2014, the figure was 9,733 units worth RM3.78 billion. 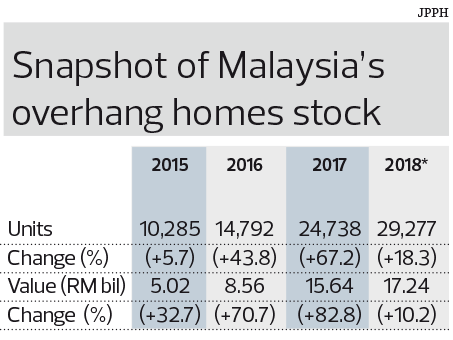 By June 30 this year, overhang homes numbered 29,277, worth a total of RM17.24 billion. In the same timeframe, overhang properties priced between RM500,000 and RM1 million essentially doubled in 2016, from 1,967 units to 3,943. It rose another 42.33% to 5,612 units last year, and hit 7,525 units (up 34.09%) by June 30 this year. On the new supply front, developers are continuing an apparent downward repositioning into the more affordable price ranges, notably in the RM250,000 to RM500,000 category. “The high-end market is less crowded now, so that itself will ease the overhang growth situation going forward,” says Foo. In a nutshell, the supply side is correcting itself to be closer to the demand side affordability levels. However, the narrowing supply-demand gap will only manifest itself in terms of JPPH data over time, given the lag effect. The latest half-yearly survey by the Real Estate and Housing Developers/ Association (Rehda), presented last week, shows that the proportion of new launches priced below RM500,000 continues increasing. In the first half of 2018 (1H2018), that proportion stood at 65%, up from 52% in 2H2017 and 44% in 1H2017, amid increasing optimism, according to Rehda president Datuk Soam Heng Choon. The survey polled 152 respondents on the performance of 1H2018 and their outlook for 2H2018. Soam tells The Edge that developers are sensing growing buyer interest in the market, evidenced by more registrations and gallery visits though that had not necessarily translated into higher sales. “It’s a buyer’s market now, so some buyers know they can get good prices. Of course, there are other issues like the ability to get a sufficient margin of financing and so on,” he says. On the flip side, the survey also echoes JPPH’s data on overhang units though definitions differ. Some 75% of respondents reported having unsold units, the highest proportion since 1H2015. Note that Rehda defines unsold units as properties not sold three years after completion. Some 45% of the unsold stocks reported by its members in the latest survey were priced between RM500,000 and RM1 million. However, Rehda remains cautious when asked whether the worst is over. Soam says that depends on disposable income growth, inflation levels and whether the feel-good factor, or buying sentiment, improves. “I would have to see in the next six months [to know] whether the worse is over. We have a new government, so they need more time [to address the problem],” he says. Overall, signs point to a soft landing for the overheated property market following cooling measures by Bank Negara Malaysia to curb runaway price growth. Foo says the property market is doing fairly well at the moment with price increases slowing to more manageable rates. “We are seeing price movement easing to between 5% and 8% in the last three years, which, to me, is more in line with economic expansion, gross domestic product growth and salary increases,” he says. However, the question of the growing overhang numbers remains even if new supply from here on may be aligned closer to what people can afford. Beyond the immediate concern that the number will continue rising, another dimension to the problem is what will happen to the overhang stock. Foo points out that JPPH’s overhang numbers are only for the primary market and do not include homes that were bought but not utilised, which can be seen from very low utilisation in some completed high-rise developments. If utilisation does not improve, then the “secondary unsold” units would re-enter the market under foreclosure and auction, which would magnify the overhang situation, he adds. “So we need to see a price correction [to ease the overhang backlog]. It is already happening in some segments of the market. We can see asking prices trending downwards because more people are prepared to listen and take position even at a loss,” says Foo. This means the overhang stock will likely see continued slow absorption, although this may not necessary be a bad thing, he adds.